Getting environmental friendly is the need of the day - tapping natural resources for vital needs can save on conventional energy. A solar water heater is one such boon for mankind. Heating up water for domestic use, factories and hospitals using a solar water heater is both environmental friendly and cost effective. Solar water heaters use solar energy to heat water and are also known as solar powered hot water heaters. System design, geographic location, collector direction and collector size are the main factors that determine the amount of energy that can be provided for domestic hot water heating. Most solar water heater systems have back-up water heating such as electricity or gas. Solar water heaters are made up of storage tanks and solar panels called solar collectors. A collector is fixed to the roof of a building or on a wall facing the sun; this will heat the water using solar energy. In few cases the collector may be free-standing. These collectors accumulate heat from the sun and use this heat to warm water which in turn is stored in a hot water cylinder. The running fluid can be pumped through the heating system as in an active system or can be driven by normal convection as in a passive system. A solar water heater is also made up of a collector to collect solar energy and an insulated storage tank to store hot water. Solar water heater using flat plate collectors: In this model the solar radiation is absorbed by glazed flat plate collectors. These collectors are made of a weatherproofed outer metallic box that is covered with a glass or plastic sheet on the top. Inside, the system water is carried through flat, dark metallic absorber sheets that are partly coated with built-in channels or riser tubes and are connected to copper pipes. The absorber absorbs the solar radiation and transmits the heat to the flowing water. Solar water heater using evacuated tube collectors: In this model the collector is made of a pair of transparent borosilicate glass tubes. These glass tubes are evacuated so that they can provide insulation. Each of the tubes contains a glass outer tube and metal absorber tube attached to a fin. The coating on the fin absorbs solar energy while restraining heat loss. These types of collectors are used for commercial applications in the US. 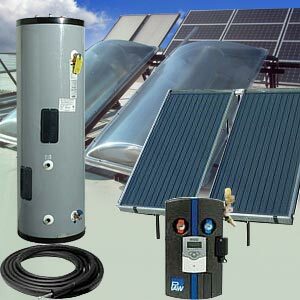 Solar water heaters using integral collector-storage system: These heaters are also popular as ICS or batch systems. These heaters include one or more black tanks or tubes in a weatherproofed, glazed box. Initially cold water passes through the solar collector, which preheats the water. The water then flows into the standard backup water heater thus offering a dependable source of hot water. These heaters should be installed during mild-freeze climates only, as the outdoor pipes may possibly freeze in severe cold weather. A simple water heating system would pump cold water to be heated into a collector, the heated water flows back to the collection tank. This type of collector can supply adequate hot water for the whole family. Savings on fuel: Replacing an electric geyser at home with a 100 liters capacity solar water heater can save up to 1500 units of electricity per annum. Environmental friendly: Replacing a domestic electric geyser with a 100 liters capacity solar water heater can reduce 1.5 tons of carbon dioxide emission into the atmosphere. Direct circulation systems: Pumps circulate water through the collectors and into the house. They work perfectly in all climates and work well in climates where it seldom freezes. Indirect circulation systems: Pumps circulate a non-freezing, heat-transfer fluid through the collectors and heat exchanger. This heats the water and then the water flows into the house. These systems are mainly used in climates that are prone to freezing temperatures. Integral collector-storage passive systems: These systems function at their best in areas where temperatures do not fall below the freezing temperature. They are also suitable for households that require hot water both during daytime and evening. Thermosyphon systems: Water flows through the system when the warm water rises and the cooler water sinks. The collector in this system should be installed below the storage tank so that the warm water rises into the tank. These systems are reliable, but the roof on which the system is going to be installed should be designed with care so that it accommodates the heavy storage tank. These systems are more expensive when compared to the integral collector-storage passive systems. A backup system is recommended for solar water heater systems during cloudy days and during increased demand. Almost all solar water heaters require a properly insulated storage tank. In one-tank systems, the back-up heater is integrated with the solar storage in one tank. In two-tank systems, the solar water heater preheats water before it enters the conventional water heater. A solar water heater can cost anything between US$ 1500 to US$ 3500. Solar water heaters made through DIY projects can cost you even lesser. According to the U.S. Department of Energy, solar water heaters will trim down the amount of energy required to make hot water by at least 50 to 80%. First Published Date: 1 Oct 2009 Last modified Date: April 18 2019 This page may have been updated recently as new information is available or the content may have been edited for better readability.